Plus Size Kitten: Goin 2 the Estee Lauder Staff Sales! I'm goin on Saturday 8am & help Xana buy her stuffs also. Only problem is where is this place/hotel and who I should ask to go :( need to find a victim with car who can take me go hehe. FYI these brands are under Estee Lauder and they'll be on sale!! It's a great bargain! I will try to sneak some pictures in lol. 3. which means if u can pick me up to go together and drop me back at my condo, i will be very happy to have u as my date go to the sale. that's all.. if u don't mind picking me n fetching me back, pls leave ur e-mail, details about yourself (e.g name n place u from, as it will be fair that u don't come all the way just to take me) btw I live in ttdi :( near 1utama. renaissance hotel have one of the best buffet spread (fresh oyster, strawberries etc) - last time lah, long time no go already - how can don't know where? i think there's a monorail stopping nearby, it's a walking distance from HRC. T_T sob sob.. got scolded by apek..
maybe i not yet born leh uncle..
4- spend money like water..
so hv u decide to go to the sale? if u need transportation to go ther, i dun mind to drop by ur place n pick u up. i need d invitation actually. read ur comment on the SNS. 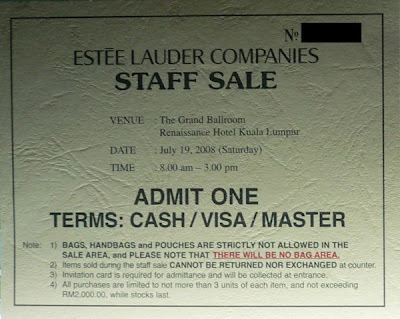 I am sooooo interested to go for the Estee warehouse sale.If you are still in need of a ride and have an extra ticket give me a buzz soon at 013-3408242.I'll live around Tropicana area so i dont think there'll be a problem in fetching you and getting there early. hi lovelypink & munah got email? yeah. oranges_pink@yahoo.com. is dat mean i'll get the invi card? woweeee! i wanted email yesterday so i could ask questions about time/location. I've decided to go with someone from ttdi (my area)who e-mail me from another forum, so sorry lovely & munah. If u girls really want to go, i read from sns, asking from dkny at sogo also can get 6 tickets. Try all the brands involved? n see whether can get or not. Too busy today to go ticket hunting..boo hoo.No worries and i hope you enjoy yourself tomorrow..go crazy gal :) I am just wondering wether one can enter without a card at later time? However i'm not willing to risk it..the skin on my body is still of the normal thickness.